As a clothing retailer you know how important merchandising is to making the sale. That’s why TRIO carries a complete line of clothing fixtures and displays for the upscale boutique and the traditional clothing retailer. You can choose from conventional slatwall fixtures or the more custom, modern look of Opto and Abstracta. 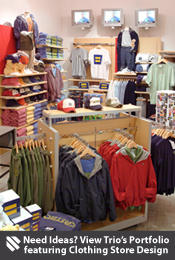 Our commitment to becoming your one-stop shop for clothing retail doesn’t end at fixtures. We also carry clothing hangers, mannequins, retail packaging such as gift bags and boxes, price tag guns, and more. If you don’t see what you need, please give us a call. 1 (800) 454-4844.